Researchers from Sussex and Swansea Universities have invented a method for morphing a liquid metal into two-dimensional shapes that can be changed seamlessly. While some way off from the morphing liquid metal robot that terrified audiences in the film Terminator 2, the technique could be useful in reconfigurable electronics, in displays and in soft robotics, the team said. The researchers, led by Yutaka Kotuda at Swansea’s Future Interaction Technologies laboratory and Prof Sriram Subramanian of Sussex’s INTERACT laboratory, are working with an alloy of indium and gallium known as EGaIn that is a liquid at room temperature and whose surface tension is very sensitive to external electric voltages. Placing a blob of liquid metal onto a 7×7 array of graphite electrodes, they manipulated the pattern of electric charge across the array to affect the tension across the surface of the blob, pulling it around so that it formed letters and a heart shape. They discussed their research at this week’s Association for Computing Machinery (ACM) International Conference on Interactive Surfaces and Spaces in Brighton, and it has been published in the proceedings of the conference. The array was under the control of a prototype graphical user interface, allowing the shape of the metal to be changed dynamically. “One of the long-term visions of us and many other researchers is to change the physical shape, appearance and functionality of any object through digital control to create intelligent, dexterous and useful objects,” Subramanian commented. 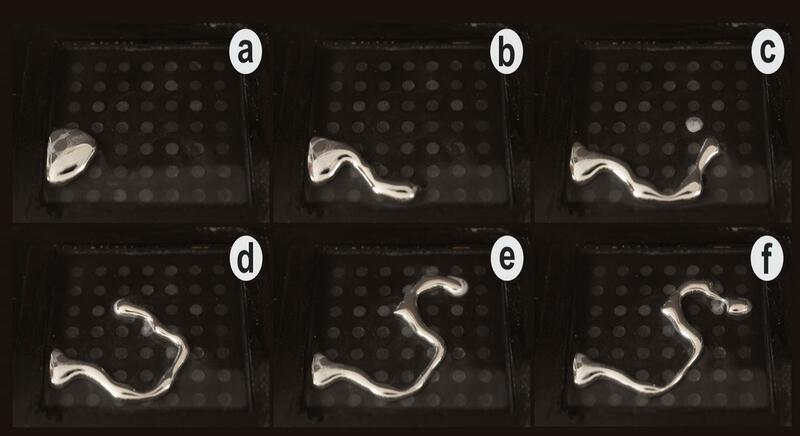 The research represents the first use of a liquid metal for such controllable deformations, the team said, with previous attempts using fabrics, rubber, gels, shape-memory alloys or systems such as magnetically-levitated polystyrene balls. Liquids, and in particular liquid metals, offer advantages because of their electrical conductivity and the possibility of liquid-to-solid phase change and control of stiffness and density. “While this work is in its early stages, the compelling evidence of detailed 2D control of liquid metals excites us to explore more potential applications in computer graphics, smart electronics, soft robotics and flexible displays,” said Kotuda. There are still imitations to the technique, in particular preventing the droplet of liquid metal from splitting. However, the researchers believe this technique might have short-term applications in making electric circuits that can be redesigned on the fly, using the metal as a programmable condutive ink.